So what was the story in 2009? How did it unfold? Now we bring you the account of the seventh day of this sublime divine odyssey. 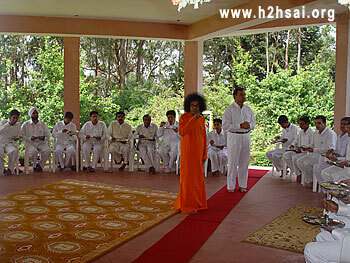 The Day Seven of Kodai 2009 was truly special because what happened that day was something fantastic and quite unexpected. But before we get on to that ‘star event’ which happened in the evening, let us go through something which happened prior to that, and that is a visit to the house of Mr. Rajiv Mahajan. Mr. Mahajan is an ardent devotee who became deeply involved from the time when Swami established the first Super Speciality Hospital in Prashanti Nilayam. He lives in Delhi and is basically into importing and distributing hi-tech medical instruments like CT scan and MRI machines for example. 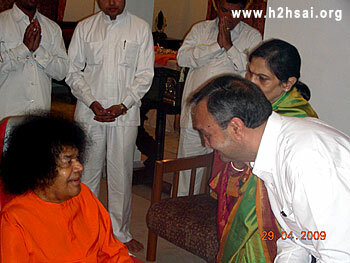 No wonder Swami came into his life when the first Super specialty Hospital was being established. 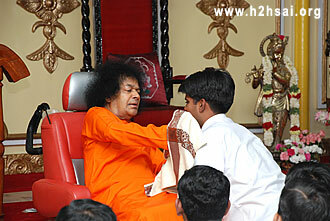 That is typical with the Sai Avatar; devotees are brought in only when the time is ripe. In a sense, this was true of Lord Rama too. For example, Hanuman, the supreme example of a passionately committed and utterly loyal devotee, entered the picture only after Sita was abducted, because it was Hanuman’s role to find out where Sita was held captive. To get back to Mr. Mahajan, since the early nineties, he is a frequent visitor to Puttaparthi who comes on every festival and also many a times during the beginnings of the months because the big Mobile Hospital which he helped to make operational goes out to the villages for 15 days, starting from the first of every month. Now it turns out that when Mr. Mahajan heard that Swami is a frequent Kodai visitor, he promptly bought a house there, and he chose one right next to a famous bungalow called the Hilltop. This Hilltop building has a long and interesting history, having once been occupied by the famous Dr. Ida Scudder, an American lady closely and intimately connected with the equally famous Christian Medical Hospital in Vellore, South India, now a University. In the flowing water, the reflection appears to be wavering, but in steady water, the reflection is also steady. Your mind develops attachment to the world because of your delusion. Everything in this world is just a projection of maya. By the way, Dr. H. S. Bhat, now ninety plus and still going strong in the Urology department of Swami’s Super Hospital, often hailed as the Father of Urology in India, worked in the Vellore Hospital for decades. Getting back to the Hilltop Bungalow, it is over a hundred years old and is at the highest point of Kodai. The estate is quite big, about eight or nine acres. The building is a kind of heritage building with wooden floors, amazing wooden rafter beams of impressive size made of genuine Burma teak, now no longer available. In earlier years, a picnic-type visit to Hilltop Bungalow was almost mandatory, and an entire morning would be spent there, complete with lunch and a protracted photo session. To complete the story of picnics to Hilltop, it was Mr. Mahajan who used to take charge of it in full. 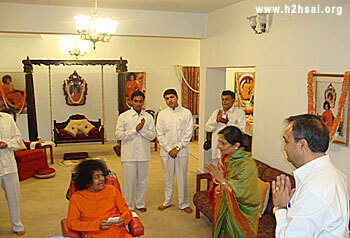 When it is time to leave, Swami would make a short private visit to his house, which was practically next door to Hilltop, while we all waited outside. By the way, this Hilltop was very close to the golf course. Now why did we say “in earlier years”? For a simple reason; recently, that property has been sold, since money was needed for many critical projects, one of them being the Housing Project in Orissa. That is a story in itself, and you can read about this in the cover story of March 2009 issue. 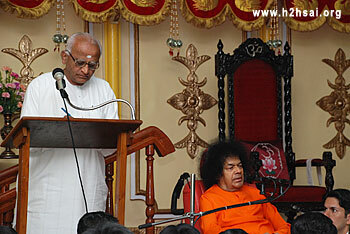 And now, we come to the most important item of the seventh day - Swami’s Discourse. 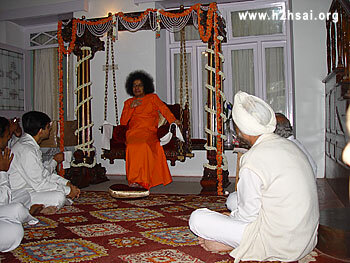 In previous years, Swami used to not only give any number of private talks to the students, but also discourses to the public. Over the years, the number of such discourses has declined sharply, and during this trip, there was just one. Here are excerpts of that discourse. Everyone desires peace and happiness; nobody wants sorrows and difficulties. All are embodiments of God. God is one. There is no second entity. When you think there is a second entity, it is untruth. Therefore, there is nothing like a second entity. There is only one entity. Where is the existence of the second? But people today put their faith in diversity and not in unity. What does unity mean? It is not the combination of many; it is the realisation of oneness. When you have mirrors all around you, you see your many forms. One who asks the question and the one who gives the reply - both are same. To consider these forms as different from each other is a mistake. When I am speaking in the microphone, you are listening to My voice. The speaker is one but the same voice is heard by many ears. There is only one Sun in the sky. But we see its reflection in many rivers, tanks and vessels. In the same way, Atma is only one. The mind, the intellect, the subconscious mind and the ego are like different vessels. Therefore, divinity is one. Wherever you see, God is there and God is one. People say, “He is Rama, He is Krishna, He is Siva, He is Vishnu.” What does it mean? Does it mean that Vishnu, Siva, Rama and Krishna are separate from each other? These are the different names of the same God. God appears before you in a particular form based on your own imagination. The forms of Rama and Krishna are nothing but your own reflections. When you say, “I want Rama”, God manifests before you in the form of Rama. There are both sorrow and happiness in the world. When you are in difficulty, you say, “Alas! Why has God given me this difficulty? What sin have I committed?” On the other hand, when you earn wealth and are happy, you say, “It is my good fortune.” Neither this is your good fortune nor is that something bad. When you have good thoughts, you will have good results. On the other hand, if you have bad thoughts, you will have bad results. Good and bad do not come from outside. Man has too many desires. Too many desires are the cause of his delusion. The cause of all desires is the mind of man. Therefore, first and foremost, you should control the mind. It is said: Less luggage more comfort makes travel a pleasure. God will be pleased with you only when you reduce the luggage of your desires. With less luggage, you will be more happy. Whatever we do, it will come back to us as reaction, reflection and resound. All that we experience is the result of our own actions. It is not given by God. God does not give anything to man except Ananda (bliss). 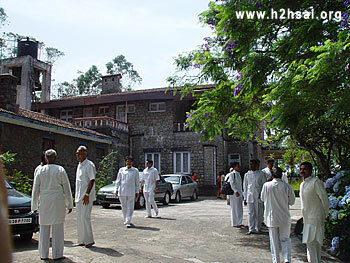 Having experienced Ananda, you should not criticise the One who has provided it to you. Both happiness and sorrow are the reflection of your own actions. When God loves you, it means that God loves Himself. God has no attributes. He has no such evil qualities like anger, hatred, jealousy and hypocrisy, nor are these evil qualities given to you by God. These are all of your own making. Therefore, get rid of your delusion. If you develop unnecessary worries, thinking, “I don’t have this, I don’t have that”, you will deceive yourself. Therefore, reduce your desires. Then you will not have to carry too much luggage. Then only can you be happy. If you have real love for God, you should always contemplate on Him. If you have liking for Rama, you should contemplate on Rama. Similarly, if Krishna is your chosen deity, you should contemplate on Him. But you should always remember that Rama and Krishna are not outside; they are in your heart. You should have firm conviction, “I am God. My Atma is God.” The Atma has no form. It has only a name. The Atma shines in everyone like the sun. It can be seen only in a heart that is pure. In the heart that is impure, you cannot see it. Many Avatars came to propagate this truth. Divine incarnations take human form not for their own sake. They come to impart the knowledge of truth to everyone. 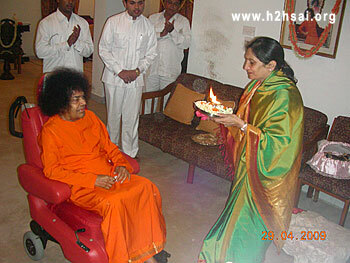 You should follow their teachings and understand the principle of the Atma. The Vedanta proclaims that the Atma is the only reality. Waves are formed out of water. There can be no waves where there is no water. In the same way, there can be no form without the Atma. You should contemplate on the Atma and chant the Mantra “Om Namo Narayanaya, Om Namo Narayanaya, Om Namo Narayanaya.” If you are unable to chant the entire Mantra, it is enough if you recite Om, because everything is immanent in Om. The word Om denotes Pranava (primordial sound). The Upanishads describe it as the Atma. 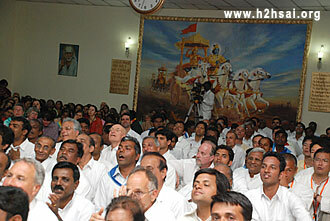 The Taittiriyopanishad deals extensively with the principle of the Atma. The Ramayana, the Bhagavata and the Mahabharata reveal the same truth through the stories of the Avatars. You should not allow your mind to become like a dog which is deluded by its own reflection. The dog is deluded thinking its reflections in many mirrors as many dogs. There are not many dogs. You may consider a dog a dog but there is God in it also. Without vibration, even a dog cannot live. What is that vibration? It is the vibration of life. Due to this life principle, the dog eats and moves around. We should not observe any differences such as “he is an outsider”, “he is a rich person”, “he is a beggar” and so on. There are not many people. All are one. Truth is one.When you follow truth, righteousness will emerge from it. When truth and righteousness come together, peace will manifest there. Where there is peace, there is bliss. Light is produced when negative and positive charges come together. Love emerges from peace. One who lacks peace cannot have love. When love manifests in us, we consider everyone as our own. All are our own forms. “All are one. Be alike to everyone” - You should make efforts to realise this truth. When the wind blows, the dry leaves are blown away, but not the green leaves. They remain with the branches. Your humanness should not be like dry leaves which are blown away by the wind of doubt. You should see unity in all. Only then will you have steady and true devotion. Many people consider themselves as devotees. So long as they have faith in God, their devotion remains steady. When their devotion wavers, their mind also wavers. True faith does not waver under any circumstances. Come what may, your devotion should not waver, even if you are cut to pieces. That is steady, unwavering and unsullied devotion. We should develop such steady and selfless devotion. The same is the teaching of Jesus too. God is one. You have to cut your individual ego to attain Him. This is what the cross symbolises. Never give up your faith. Hold on to it firmly. Then you will certainly realise your true identity. Man is born to establish humanness and not to destroy it. 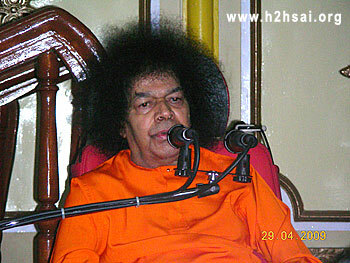 We should develop human qualities of Sathya, Dharma, Santhi, Prema and Ahimsa. When Sathya combines with Dharma, Santhi and Prema are born there. It is love that unites all. Will you kill your son in a fit of anger? No. You may scold him, but not harm him. Likewise, when you have love, you will treat everyone as your own. Treat all women as your mothers and sisters. You should develop such sacred feelings towards all women. When you marry a woman, only then you call her your wife. Otherwise, all women are like your mothers and sisters. Similarly, all men are like your brothers. God is one. He is the only Purusha (male). There is no other male except Him. Today this equality and unity have become extinct in this world. Due to lack of unity, we are unable to see divinity. Today the world is in the grip of differences and fighting due to lack of love. Man today has forgotten his humanness. First of all, you should understand that you are essentially divine. When you say, “I am man and He is God”, you observe duality. When there are two entities, the third will also find place there and that is the mind. That will bring about your total ruin. Duty of a human being is not merely doing some work. Duty connotes Nishkama Karma (selfless work). A selfish person is worse than a fish. Fish is better than selfish. Therefore, we should never give room to selfishness. You can realise the Self only when you give up selfishness. When you become a slave to your senses, you will always remain selfish. Therefore, give up selfishness. Help everyone. Right from today, make efforts to do away with all differences. When you love God, you should worship and follow Him. This is the main goal and true purpose of your life. 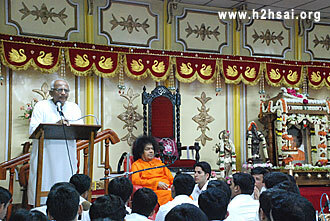 – Divine Discourse in Sai Sruthi, Kodaikanal, April 29, 2009. After the discourse, the Burrakatha boys received some more appreciation and then followed aarathi. 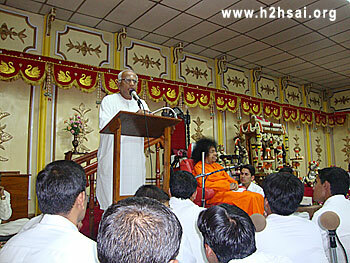 With this, the seventh day of Kodai 2009 formally came to a close.